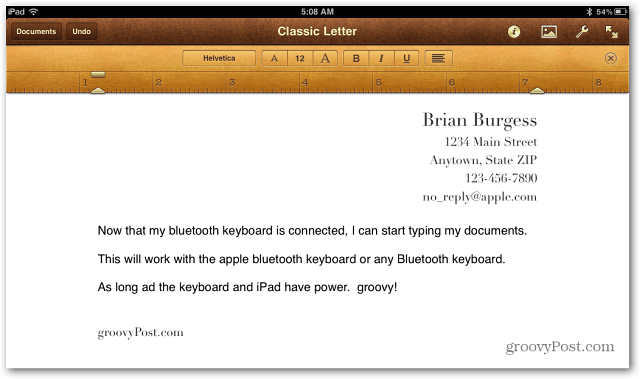 The onscreen keyboard on the iPad works fine for basic browsing and media consumption. If you want to do a lot of writing on it, adding a Bluetooth keyboard is your best bet. Here’s how to connect it. 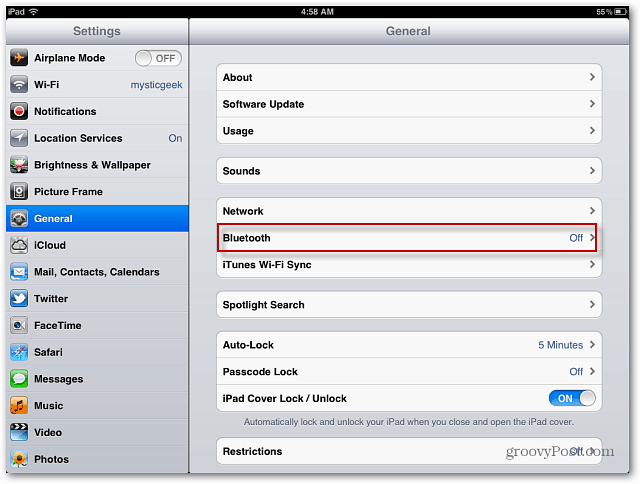 First, on your iPad go to Settings >> General >> Bluetooth. Now switch the slider to ON. 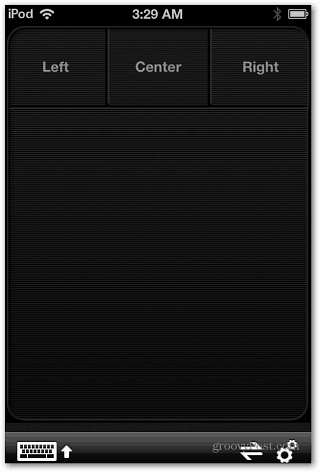 The Devices field will display and is now searching for Bluetooth devices. I’m connecting a Bluetooth keyboard that came with my iPad case. Verify you have batteries in the keyboard, power it on and press Connect. 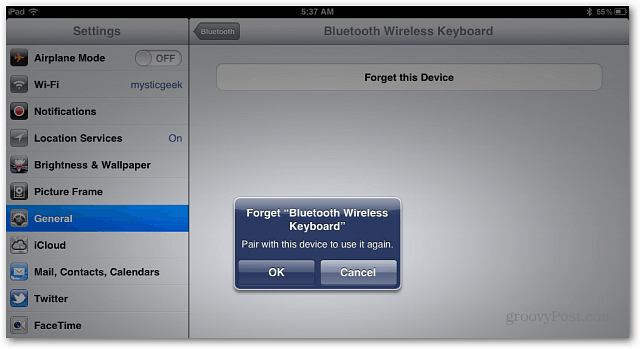 Keep in mind each Bluetooth keyboard is different, but the process is essentially the same. When it sees the keyboard, tap it’s name. 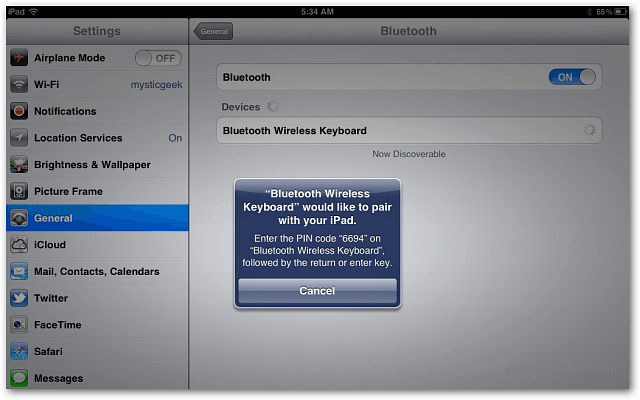 Then a message displays telling you to type in a four digit code on your Bluetooth keyboard and hit Enter. Now you’ll see the keyboard is connected to your iPad. Now open your email or favorite word processing app – I’m using Pages, and begin typing away. If you have a different Bluetooth keyboard that was already paired with your iPad, tap the blue arrow next to Connected. Then on the next screen tap Forget this Device. Then tap OK and repeat the steps above to connect the new keyboard. If you’re not a fan of the onscreen keyboard, and want to make your iPad a better productivity device, add a Bluetooth keyboard. You’ll get a lot more done that way. I have a BELKIN F5L090 keyboard and cannot keep it connected to my ipad2. I cannot find any manual on the keyboard on the internet and it is driving me crazy. Have tried to email Belkin – no response. Any advice? I have a new Belkin F5L090 keypad and have the same problem as Maddy. I cannot keep it connected to my iPad either. I can pair the keypad to the iPad and it works great. I leave them for a while and come back, and they do not work together any more. I can re-pair them and they work well until I don’t use them for a while, then I have to pair them up again. It is a brand new keypad. Belkin wants me to send it in for repair. That is a hassle; I will return it to the company I purchased it from for a full refund. keyboard is a piece of crap. company are the pits for any service.